HARD FRENCH HEARTS TRANSFORM SF! Stand up and be counted! Be proud of who you are and speak up about it. Transform SF, a coalition of four community based HIV prevention organizations, gives you that chance. Transform SF will be conducting our Transgender Community Health Survey (which includes a free, rapid HIV test), outside of Hard French on 9/1 from 4:00 – 8:00 PM. Participants get into Hard French for FREE!!! …plus a $20 gift card for participating. Our Transgender Community Health Survey is a survey of the Transgender community who lives, works, or plays in San Francisco. Our goal is to better understand how discrimination, mistreatment, and other social factors play into the HIV prevalence rate in the SF Transgender community. For far too long HIV/AIDS has ravaged the Transgender community. With a prevalence rate of nearly 30%, (in contrast, the national average is less than 1%) the Transgender community has been disproportionally effected by the epidemic. But this doesn’t have to be the case. Stand up, be counted, and be heard. 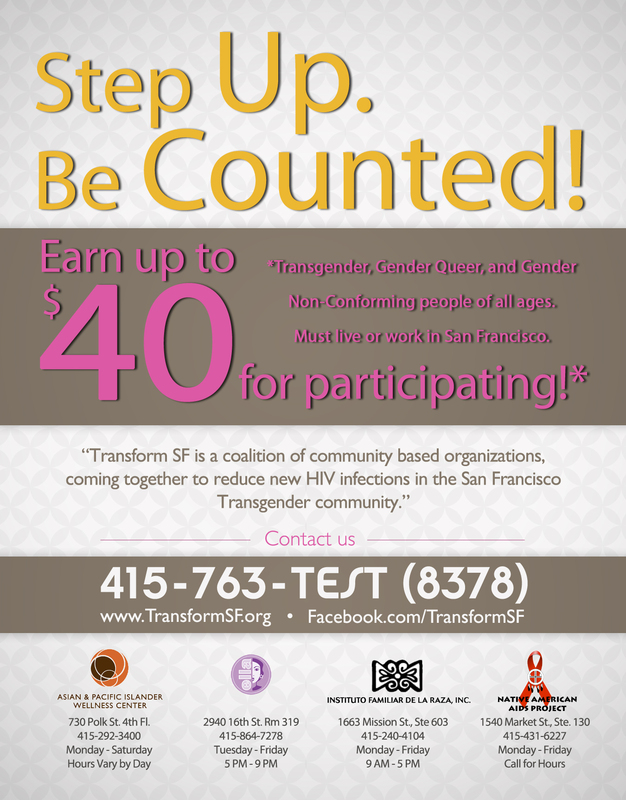 The Transform SF Transgender Community Survey, which includes a free, rapid HIV test, offers a $20 gift card every 6 months for participants. If you can’t make it to this Hard French – contact Erin Armstrong for more information, or to make an appointment – (Erin@APIWellness.org) 415.292.3400 x 113.